You’d have a tough time finding someone more accomplished than Maya Moore. Her extensive resume is highlighted by four titles in seven seasons, five All-Star selections, and an MVP award, already establishing her as one of the best to ever play the game. And she did all of that before the age of 29. In addition to dominating on the court, she’s also proven to be incredibly influential off the court as one of the biggest stars in women’s basketball. She became the first female basketball player to sign a deal with the iconic Jordan Brand, where she’s received several successful player’s edition shoes and helped grow the women’s game with events like the Jordan Brand Classic for high school All-Americans. 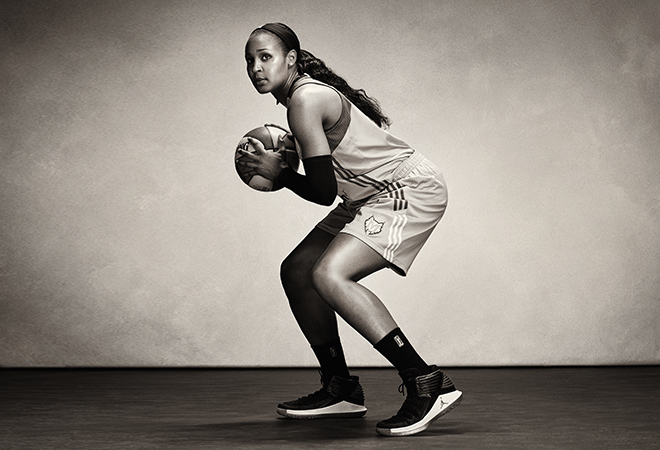 We asked Maya Moore about winning championships, working with Jordan Brand, and what’s next for the superstar who’s already done it all. Q: You won your fourth title last season. How does that compare to your previous championships? Q: You’ve won at every level: college, pros, and internationally. What’s your secret? Q: What advice would you give to athletes who look up to you? Q: You’re one of the biggest names in the game now. What’s that been like? It’s really a privilege and a responsibility to represent our game well no matter where I am. I represent the WNBA whether I am on or off the court. Q: You’re the first female basketball player to sign with the Jordan Brand. That has to be a pretty cool feeling. Q: You had some Jordan PEs come out recently. What’s that process like? Q: The new AJ XXXII just debuted recently. What do you think about the newest edition to the Jordan line? Q: You’ve already had so many incredible moments in your career. Can you even pick a favorite? Q: What are three tips you’d give to someone who wants to become a pro? A: “One, I would say become a student of the game or be an even better student of the game. I’d say number two is nutrition – being super mindful of what you put into your body so that your body can perform at its highest level, whether that’s pre-workout, during, or post-workout. Q: And lastly, what’s next for Maya Moore?